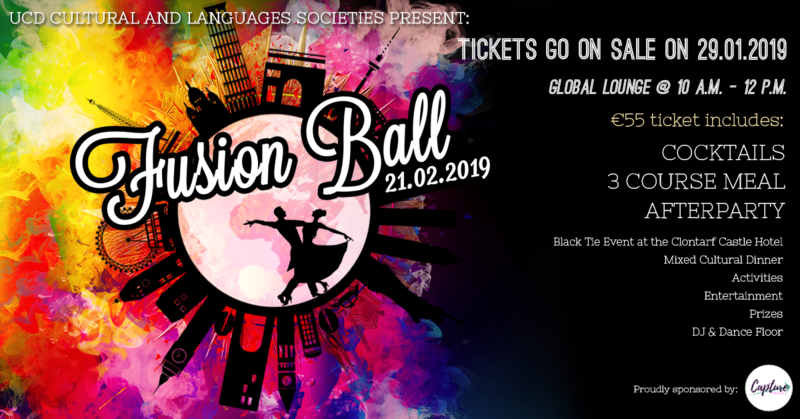 The UCD Cultural and Language Societies would like to formally invite you to the Annual Fusion Ball in Clontarf Castle on 21/02/2019. This Annual event will be a cultural experience no UCD student will want to miss, with a concoction of cultural food, a lavish photobooth, memorable activities, and unforgettable entertainment. So grab your suit or dress, and get ready for a full Admission Ticket @ €55 for the Fusion Ball! with a travel deal of €5 up and back to the Castle, because we just love you that much. Online Tickets are on sale NOW! And will be at Global Lounge on Jan 29th. A special thank you to Capture Travel for their continuous generosity and great students deals! If you have a valid University ID card, you can simply use this as your ticket by selecting the ID type and entering your Student/Staff ID number below. You can then just present your University ID card at the entrance, no paper ticket required. Any additional dietary requirements or allergies? By clicking the button below, you are confirming to us that you have read and agree with the Terms and Conditions for this event. IMPORTANT: When asked to enter your email address, please ensure it is spelt correctly. We get a lot of emails from people who don’t receive their ticket confirmation email, due to mis-typing their email address at the time of the payment.